Our experienced, dedicated, and knowledgeable CrossFit 951 coaching team is committed to helping you reach your health and fitness goals. We provide quality coaching, excellent programming, accountability, nutritional guidance, and an unmatched 951 community. Our coaches are the best at what they do. They hold numerous fitness certifications and degrees, along with continuing their education through seminars and coaches’ meetings to develop and learn from other fitness and medical professionals. What makes them stand out from the rest is their proven track record of helping individuals of all ages and every fitness level grow, succeed, and develop day in and day out. As much as we value health and fitness, we also value living life to the fullest and paying it forward. We love to plan activities outside of the box that keep us moving and experiencing new things. Our motto is “Work Hard. Play Hard.” We like to have fun and enjoy hanging out with each other. We are also very passionate about helping others. Our box participates in numerous fundraisers throughout the year and supports all of our members in times of need. When you join our box you are not just joining another gym, you are joining a family. Greg aka “The Gypsy” has been CrossFitting since 2010. He puts his heart and soul into CrossFit. We can attest to this by the amount of sweat that he leaves behind on the gym floor. 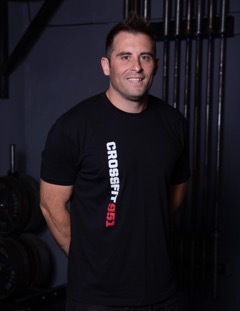 His ability to connect with clients has made him the social icon at CrossFit 951! Greg prides himself in his cardio and believes that form and technique are most important. He has participated in many sports in his life, however, CrossFit is his true calling. First and foremost, Sarah is a wife to a wonderful man and a mother to 4 great kids. She has a Bachelor of Arts in liberal studies with a specialization in human development from Cal State San Marcos. From the time Sarah was little she never sat still. As a child she participated in as many activities as she could including gymnastics, soccer, swimming, softball, field hockey, cheer, and dance. Sarah has always loved working out. As an adult she has continued to stay active by participating in yoga classes and even an occasional dance class. Any chance she gets, Sarah likes to take advantage of our beautiful SoCal weather, with water skiing and snowboarding being her recreation of choice. 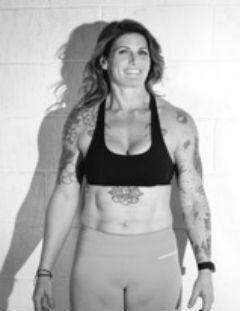 She found CrossFit in 2010 and was instantly enamored with the positive competitive spirit it provokes and the unmatched intensity it requires. 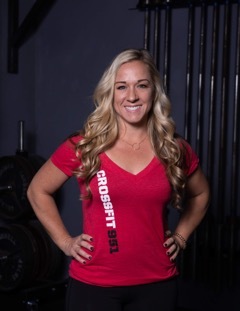 Sarah loves teaching and is excited that she gets to help others in their CrossFit journey. You will always make time for what you love to do! Corinna has always been an active person starting at a young age. She played softball and volleyball in high school, making varsity in both sports by her sophomore year. She then went on to play volleyball for two years at Citrus College. After that, she decided to focus more on school so she transferred to Cal State Long Beach where she earned her Bachelor of Science in business management. Shortly after graduation Corinna married her longtime boyfriend, Todd, who is now a firefighter/paramedic for The City of Riverside. They decided to begin a family right away and now have four beautiful children: Emma, Jacob, Luke, and Samuel. Corinna started CrossFit when her youngest son was about six months old. She had been in and out of gyms, worked out at home, and was a part of a private moms’ workout group prior to starting CrossFit. Nothing really caught her attention for long enough and she kept wanting more. A friend recommended she try CrossFit 951, and after day one she was hooked. She was a little intimidated at first by the barbell and gymnastics movements, but that faded fast as she jumped right in with both feet. 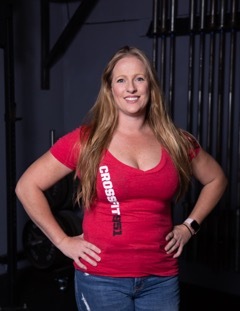 She loves the team and competitive atmosphere that CrossFit provides, and loves to compete with her husband or friends in local competitions. With four kids, Corinna’s schedule is always full, but she still finds time to get to the gym. Besides her family, of course, CrossFit is definitely what she loves to do! Matt is an active father of 4 beautiful children. He started his CrossFit journey when his brother, the Wellness and Fitness Coordinator for Orange County Fire Authority, recommended a change to his mundane chest, tri and bi workouts at 24-hour fitness. 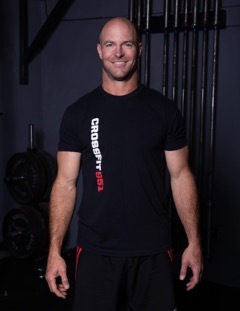 Matt has a deep history with athletics so when his passion of physical activity united with CrossFit’s theory of functional fitness, he immediately fell in love. CrossFit’s intensity, comradery and family atmosphere really resonated with him. Matt is a graduate from Eastern Michigan University, where he received a football scholarship and obtained a Bachelor of Science degree in criminology. He worked in the criminal justice system for a short time before becoming a General Contractor. In January 2014, Matt was diagnosed with Stage IV Melanoma with malignant tumors in the bone marrow of his legs, both lungs and on his adrenal gland. In January 2015, Matt had his first clean scan! When Matt was diagnosed, he thought he was in the best shape of his life. 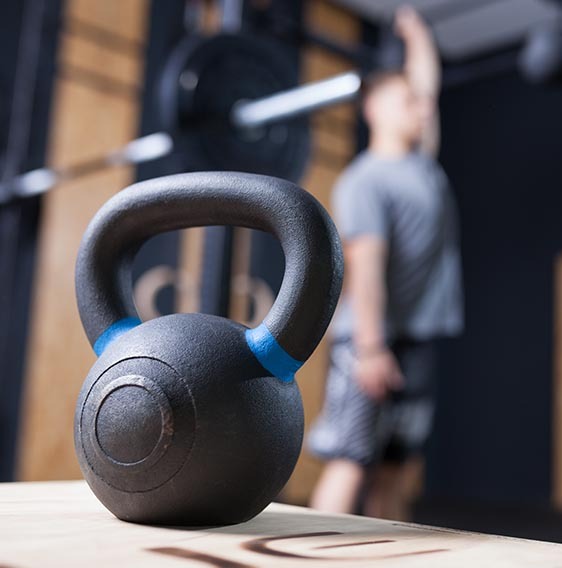 He had been a devoted CrossFit athlete for 4 years and had learned the importance of fueling the body correctly so he couldn’t figure out why he was struck with such a debilitating disease. Although cancer has plagued several years of his life, CrossFit has given him a fighting chance. Matt’s doctor and nurses believe his resilience and ability to bounce back after the first year of battling this disease and going through chemo and immunotherapy treatments are a testament to proper nutrition and a smart, effective physical activity program. Matt wishes to share his experiences and knowledge with others and strives to bring smiles to more faces. Mechelle has lived in the Menifee and Murrieta area her whole life. She started CrossFit in 2012 when she was first diagnosed with ulcerative colitis and celiac disease. Mechelle was very used to being involved in high intensity hobbies/sports so being told to stop with high intensity workouts didn’t sit well with her. Participating in dance and cross country during her childhood and high school years made joining CrossFit an easy decision. She needed something that would be a challenge and something she would have to put effort into in order to progress. 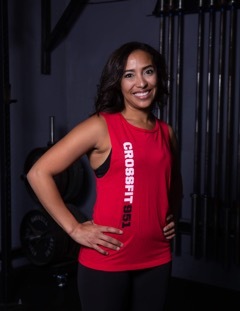 Mechelle loves the feeling of accomplishment after putting in the work, and that’s exactly what CrossFit does for her. It was a distraction from her disease and she truly believes that CrossFit helped her get through the initial challenges. Mechelle is currently in remission and finds joy in coaching others and helping athletes anyway she can. She truly loves being able to help a member accomplish their goals or help them with a movement. Mechelle is striving to learn as much as possible so she can be the best coach and best version of herself. Lea started her fitness journey working out at a Kettlebell and CrossFit gym almost 10 years ago. She joined a gym-wide Whole30 nutrition challenge shortly thereafter and realized the impact that food has on our health, fitness, and everyday activities. Food and nutrition became a huge area of interest for her and she’s never looked back. She started a paleo meal prep and delivery company in 2010 before meal delivery was a household term. She became more and more interested in food and helping people eat in ways that would positively affect their health, workouts, and overall wellness. During this time she was also coaching CrossFit and realized how amazing it felt to help people lose weight, get healthy, and discover the best version of themselves. Lea sold Primal Cravings in 2014 and is now the SoCal Community Builder for Territory Foods. Territory specializes in delicious meals geared toward those with an active lifestyle. As she continued her journey, Lea wanted to find ways to better help more people with their nutrition. She was certified through Precision Nutrition in 2017 and started Blue Lotus Wellness. Blue Lotus focuses on flexible dieting and overall wellness. Seeing her clients succeed and develop a healthy relationship with food is her number one goal. On a personal note, Lea is the mother of 3 amazing kids, loves the barbell, hates thrusters, and should never be allowed to dance in public. She spends a ton of her time cooking and creating recipes, tries to get outside as much as possible, and is usually over caffeinated. We are remembered not for what we acquire, but for what we give. 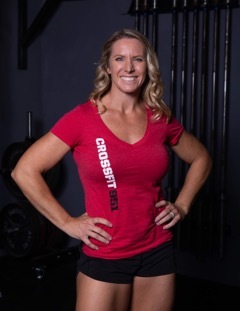 Lisa joined CrossFit 951 in 2014. She did not have prior athletic experience, but has since embraced the lifestyle of a CrossFit athlete. Lisa met the love of her life at the box and they are now happily married (Coach Greg is a lucky man)! She has a career in the healthcare industry where she works with seniors. Lisa is also a proud dachshund dog mom to Boris and Bodie! Amanda was born in Fresno, CA. She is married to her best friend, Jose. They have been married for 10 years and have three beautiful kids together: Mariah, Savanah, and Matthew. Amanda has had an amazing journey that started with her trying CrossFit for the first time in 2016. Since then, she has lost over 60lbs and has gained her confidence back. 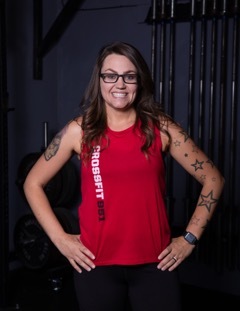 She currently works as a Child Care Provider for CrossFit 951 and a Health Technician for the Menifee Union School District. Amanda also takes college classes and has 32 credits in child development. 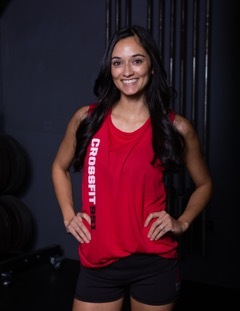 She continues to help our CrossFit 951 athletes reach their goals by making sure she provides quality care for their little ones while they focus on their health and fitness. Strength is on your side. Robyn is first married to her husband and the mom of beautiful twin girls. 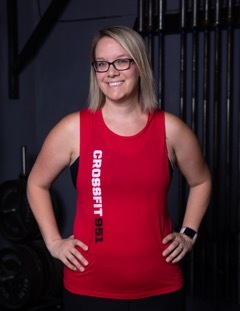 She has been doing CrossFit since 2016 and has worked as a Child Care Provider for CrossFit 951 since 2017. Robyn is currently pursuing her psychology degree at CSUSM with hopes of obtaining her LMSW.